Frangipane, frangipane, frangipane. How I want to like you, but I just don’t. The combination of sweetened ground almonds reminds me too much of the detestable marzipan. But as the GBBO alternative challenges this week were a complicated and difficult looking pudding, and a selection of vol-au-vents which I love but my tummy doesn’t need at this time, frangipane tart it was. Plus, I have always fancied making a frangipane tart. 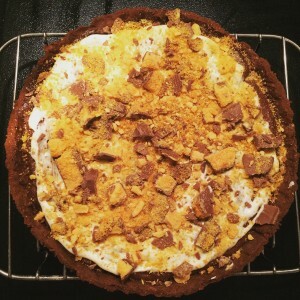 I’d seen a creme egg bakewell tart on Emily’s Recipes and Reviews and really fancied the idea of making one. But I didn’t want to eat one (very rare for me to not want a sugary treat). Fortunately it was my friend Fiona’s birthday on Thursday so I decided I’d make it for her as a surprise instead. 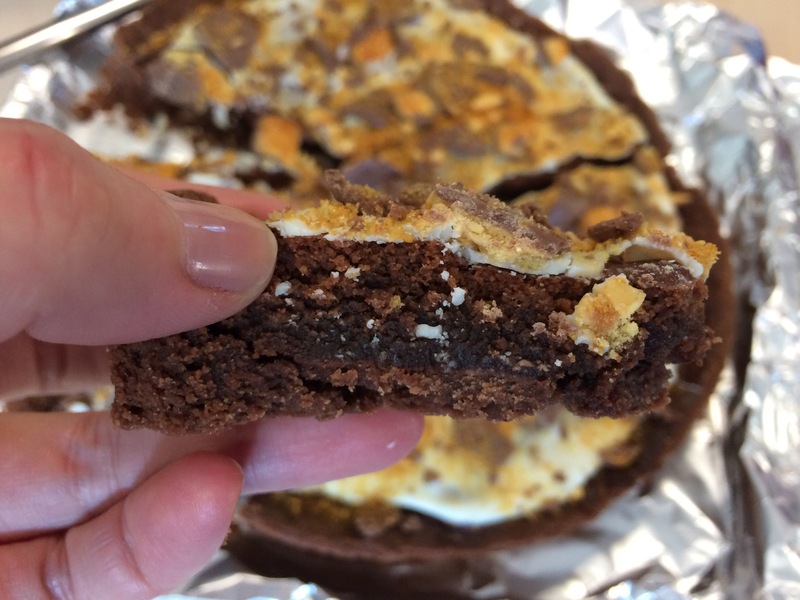 Although I thought Emily’s creme egg bakewell was a lovely idea, I wanted to make some tweaks, including a chocolate tart case, a layer of chocolate spread, and Fiona’s favourite crunchies to decorate the tart. 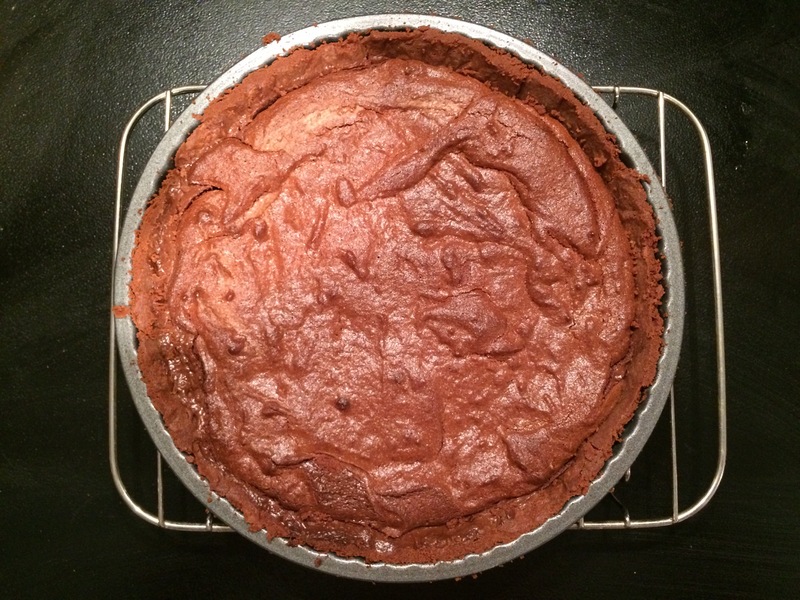 I found a recipe for chocolate shortcrust here, and made up the rest myself. Lucky for me Tesco had sent me a voucher to buy the ingredients for this week’s challenge (thanks to Jenny from Mummy Mishaps for working with Tesco to help all of the Great Bloggers Bake Off bloggers have the chance to get a little helping hand from Tesco with one of their bakes), so I was able to buy all of the ingredients from my local Tesco Metro. 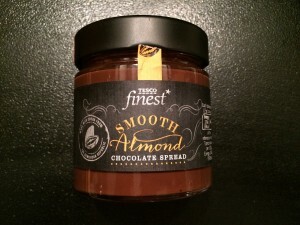 I was actually quite surprised to find ground almonds there (it’s only a tiny store), and had no trouble picking up the other ingredients I needed: white chocolate, crunchie bars, chocolate spread and cocoa powder – chocolate heaven! I’ll make a confession: I did actually try the finished tart and I wanted to like it but it did taste too much like marzipan for my liking. However, the birthday girl Fiona and everyone else seemed to enjoy it so if you don’t dislike marzipan then you’ll be okay. Firstly make the pastry. I blitzed the flour, cocoa powder, icing sugar and salt with the butter in a food processor until it resembled brown breadcrumbs, then cautiously added the water until it clumped together. 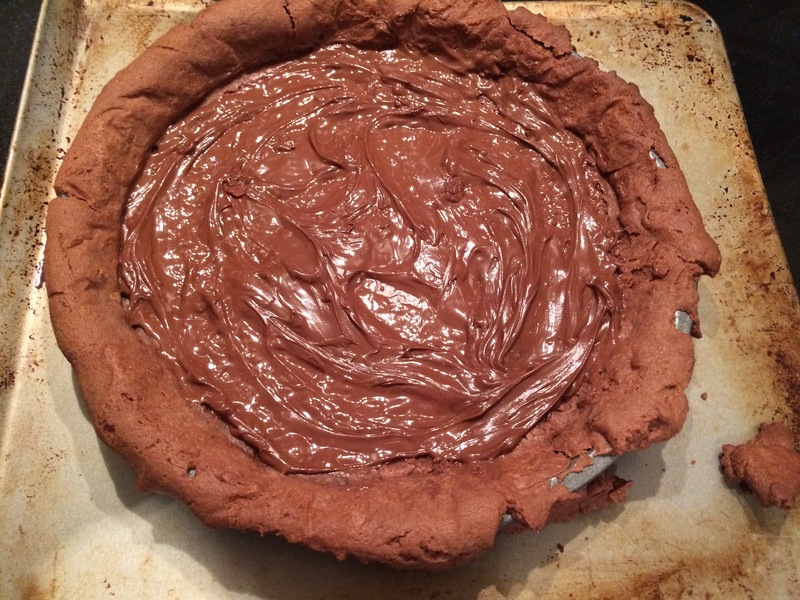 At this point you should chill the dough for at least 20 minutes so it rests, but I didn’t have time (making a tart after work means you need to be efficient and cut corners!) 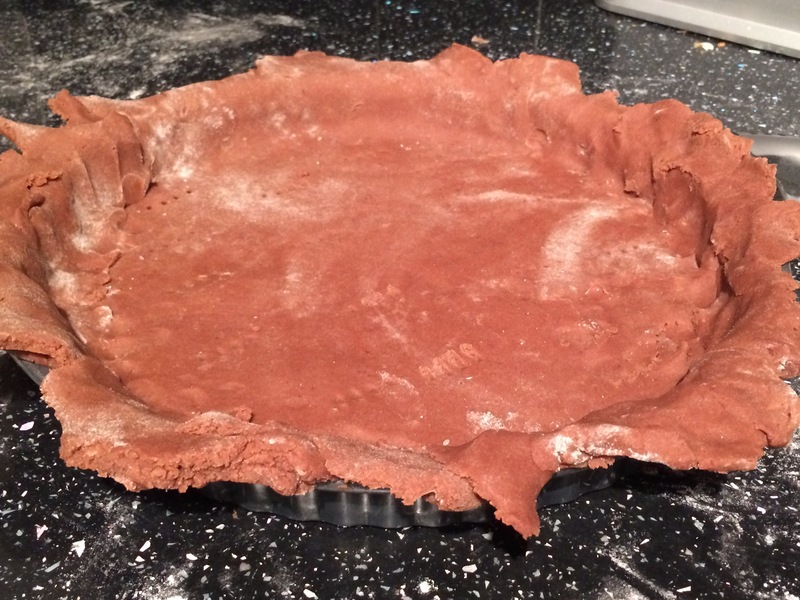 so I lined my tart tin with the pastry, leaving an overlap outside of the tin (again you are supposed to chill the pastry at this point but I didn’t), pricked the base, lined it with greaseproof paper and baking beans and baked the pastry for 10 minutes at 170 degrees. 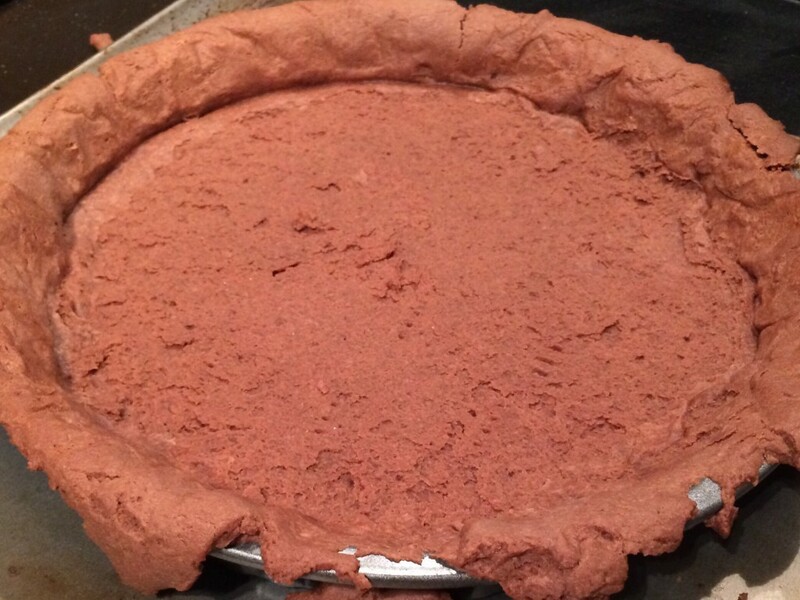 Then I took away the beans and paper (taking some of the pastry with it … probably because I had not chilled the pastry) and further baked the pastry for 10 minutes until almost cooked. Leave the oven on and allow the case to cool slightly while you make your frangipane: basically just blitz all the ingredients together in the same food processor (I didn’t even wash it from making the pastry) and you’re done apart from a couple of scrape downs to make sure everything is well mixed. Spread the chocolate spread onto the pastry (this is the equivalent of the jam you would find in a bakewell tart), then cover with the frangipane mixture and bake again for 30 minutes at 170 degrees. When cooked the frangipane will feel firm to the touch, like a cooked sponge. As soon as you can when the tart comes out of the oven, trim the pastry by running a knife across the top of the dish to make it look neat and tidy. 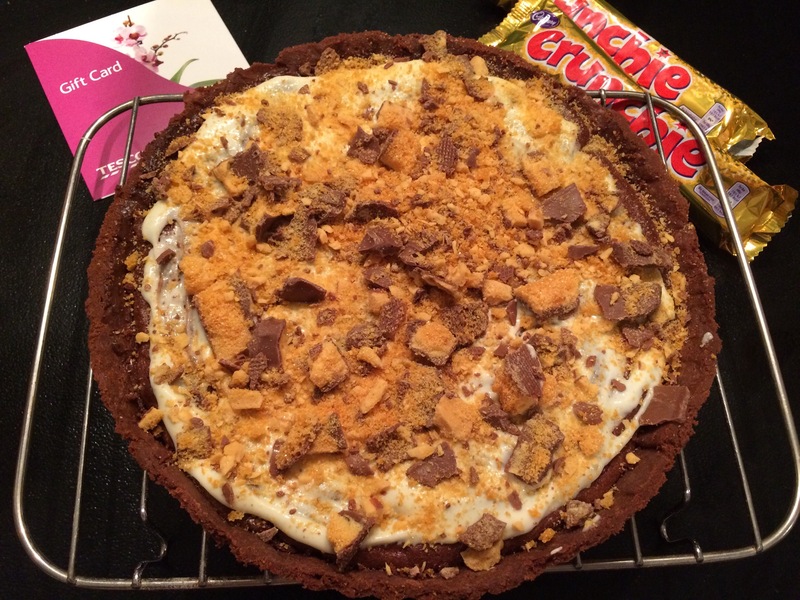 Allow the tart to cool on a rack and once it is cold, melt the white chocolate (90 seconds in the microwave did it for me) and spread it over the top of the tart, then cover that with crumbled crunchies (I smashed them up into irregularly-sized pieces with a rolling pin). 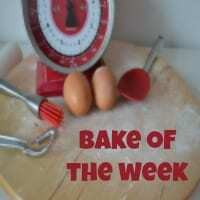 Once again I am taking part in various challenges again, including The Great Blogger Bake off hosted by Stacey at Nobody Said it was Easy, Bake of the week over at Casa Costello, and The Pastry Challenge hosted by United Cakedom. Oh my goodness. 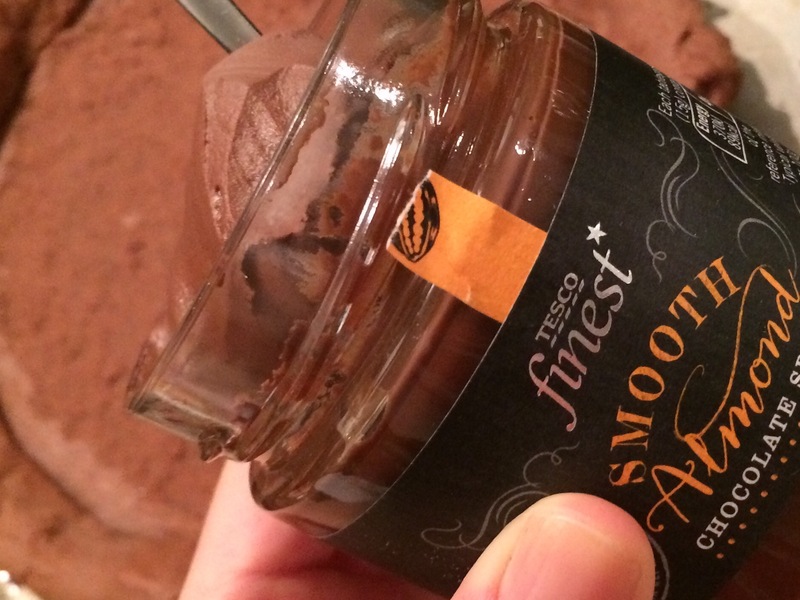 That chocolate spread… and the Crunchies… I’m in chocolate heaven! Fun! I’m loving catching up with your cook-along challenges. Nooooooo! I love marzipan, and almonds too. 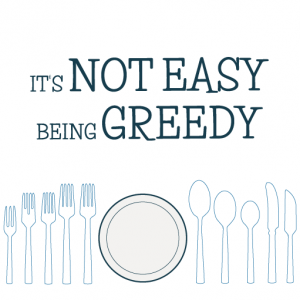 But I appreciate its not for everyone. You’re doing so well keeping up with the GBBO challenges – I am mighty impressed! I like almonds, but it’s the mixture of them with sugar to create that marzipan flavour that I can’t stand (I think it’s because I got sick after pigging out on almond croissants when I was younger, so I just cannot stomach the taste of marzipan / frangipane etc now!). It’s quite a slog to keep up with the challenges, but getting me to try new things / discover new ways of cooking, so I am enjoying it. Puff pastry for tonight …! Oh my life that spread looks AMAZING!! Must hunt some down and try it. Thanks Sarah! 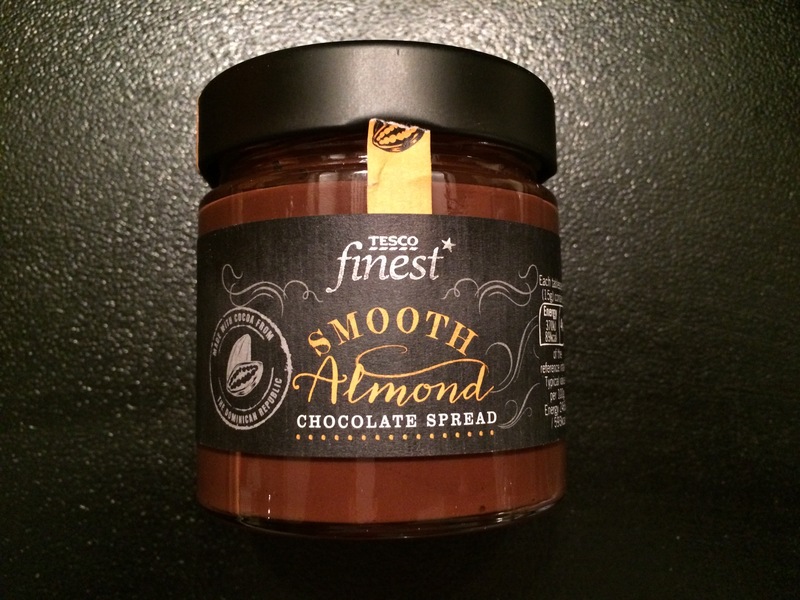 I am going to do a review on chocolate spreads soon so will keep you posted (it’s a hard life ;)). Hello! 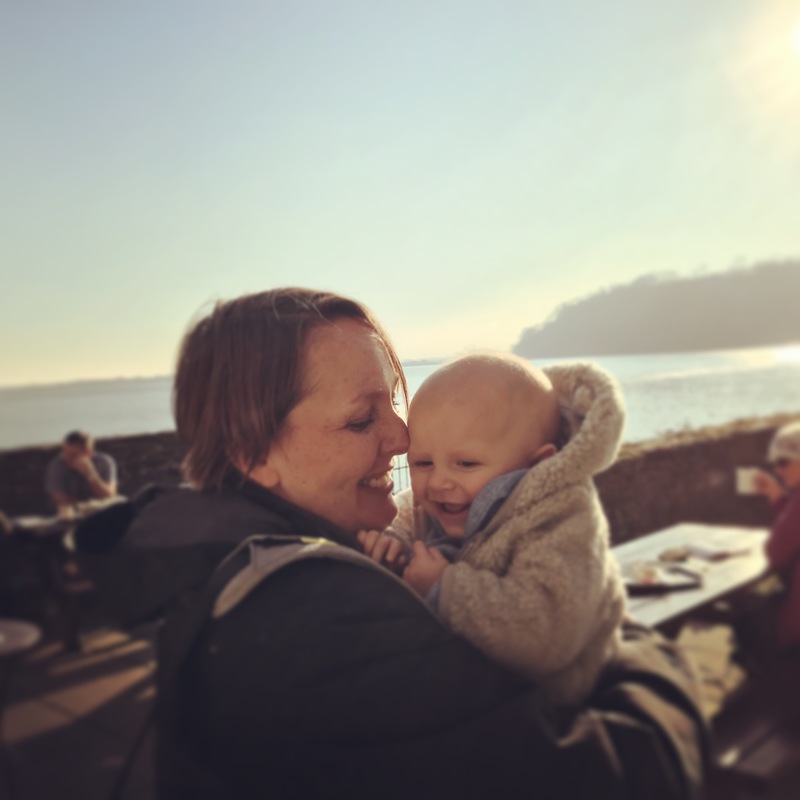 I’ve just discovered your blog, lots of things to read! This looks lovely, I really need some of that almond chocolate paste in my life! Who wouldn’t love a chocolate pastry filled with more chocolate! This looks very rich and I’d love to have a slice! Thank you for entering it into September’s Pastry Challenge!